"Foreigners should not own Ukrainian land." The participants of a rally underway in front of Verkhovna Rada demand a moratorium on the sale of farm land. An LB.ua reporter says the rally is well organized. 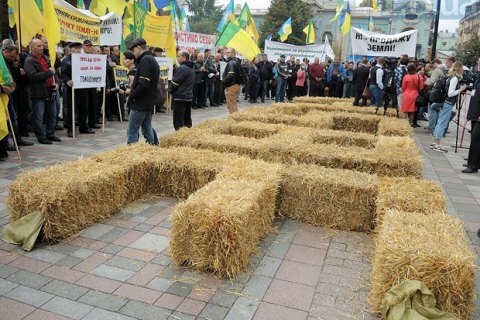 The protesters have formed from hay bricks the number "№ 3851-1" of the bill they demand the parliament to adopt. They said they oppose the sale of land to foreigners, because this is a "threat to Ukraine and its citizens" and demand government support for small farmers. In November 2015, the parliament extended for a year the moratorium on the alienation of agricultural land pending the development of a bill on the turnover of agricultural land before 1 March 2016. This was not done. The current moratorium expires at the end 2016. On September 15, a bill was submitted to extend the moratorium until the end of 2021.